Since then it would appear that the universe heard me (or at least jewelry designers) and all around me I started seeing more and more rose gold baubles popping up! I first noticed them in a shop window in Paris in September 2009, and then slowly in magazines, first from the Cartier types and now everywhere! So I just want to say, “I told you so!” and feel ever so slightly victorious in this post. And to celebrate rose gold, here are some of the new styles I’m seeing. By the way, rose gold works for men too! White gold looks like stainless steel and yellow gold is sometimes just too flashy. So I stand by my choice. Rose gold is the ultimate in romantic jewelry. Each woman is completely different and jewelry must be an absolute fit to her personality, for as a close friend once said to me, “jewelry is so very intimate, it sits just against your skin…” she’s right. For me, only rose will do. 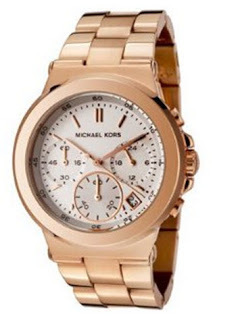 So my first suggestion for holiday gifts: a timepiece or other jewelry in rose gold. Main image above is of the Breitling Transocean Men’s Watch, just came out. Gorgeous, non? I actually already have that Burberry watch from my original rose gold blog post, but now I’m eyeing a full metal strap one by Michael Kors. About $230 on Amazon.com, but $175-$185 on other sites so shop around for the best deal. 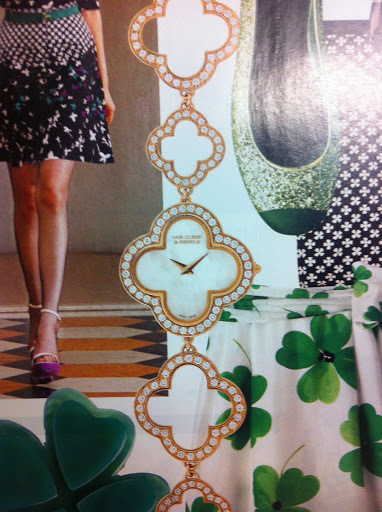 Now this beauty, I can’t find a photo of this watch ANYWHERE on the web, so perhaps it’s too new. This is simply a photo of the page I ripped out of my copy of Elle. Really beautiful ladies watch by Van Cleef and Arpels, dial is mother of pearl and each link is lined in diamonds. I’d LOVE it if Santa brought me this! Previous Post What a Spectacle!